Before arriving in Alaska, it is important to be familiar with the types of equipment you will need for your fishing adventure. Whether you’re a novice or a seasoned angler, the proper equipment makes all the difference. In planning for your trip, you should consider the type of fish you are targeting, time of year and your personal comfort expectations. The kind of fishing gear you’ll use depends on the time of year you are planning your trip, type of water you are fishing and what species of fish you are after. The equipment you use must be appropriate for the size and strength of the fish. Also as important to any successful fishing trip is that your flies/lures mimic or blend naturally into the fishes’ native environment or attract a strike reflex. While the specific kind of gear you’ll need depends on what and where you’re planning to fish, there are some essential materials that all anglers must have. Here is an overview of the standards in fly fishing equipment. Fishing rods are available in a variety of different materials, lengths, and weights. Choosing the appropriate rod for you depends on your level of experience and comfort with casting lines, as well as the weight of the fishing line. A heavier fishing rod can cast sinking tip lines of varying weights with ease, allowing for a much smoother casting. But if the line is too heavy, it’s more difficult to cast, and this can lead to added stress on your back and shoulders. A quality rod is an investment, but with the proper care can last you for years and will always make for better, more successful fishing. Rods are easy to assemble and come in 4-piece travel models, as well as a standard 2-piece. For most fish, we recommend 9 – 9 ½ foot rods, with the weight depending on the targeted species size and aggression level. Trout, Arctic Char, and Arctic Grayling are fished with a 5,6 or 7 weight rod. Many fish in the salmon family (silver salmon, pink salmon, chum salmon, sockeye salmon) put up more of a fight and a 7, 8, or even 9 weight rod is ideal. But Chinook salmon demand a 9, 10, or 11 weight rod. Also known as King salmon, these are the largest of the species, and are highly sought after by experienced anglers looking for a challenge. We recommend a 7 weight rod as an all-around best choice. Fishing lines are a crucial component of your fishing gear, so it is important that you are familiar with the different types of lines and how to choose the right one. There are numerous factors that go into picking a line. Fresh water or salt, warm or cold water, floating or sinking, high or low visibility and weight properties should be considered. Most retailers can recommend an appropriate line based on where you are going to fish or a quick internet search can yield the information. We recommend bringing a weight forward floating line for general use. Mossy’s Fly Shop in Anchorage can help answer questions about the different kinds of fishing lines out there and their appropriate uses for fishing in Alaska. It’s a great place to visit on your way to the lodge. If you don’t own gear or don’t want to purchase any, we will loan all rods, reels and lines at no charge. In the past, fishing flies were often made of real organic materials (bits of meat, fish eggs, fur, or feathers, etc. ), but modern anglers often use synthetic flies. Whatever the materials, the objective is to mimic insects or other marine life that are a part of the fish’s natural diet. Anglers can choose the type and brand of fishing fly that suits them best, but many also make their own, using beads, feathers, threads, and other objects carefully woven together. Bright colors help make flies more visible in the water and catch the fish’s attention. The key, however, is to know what your fish eat and to research which types of flies have the best luck in luring them. By imitating a source of food, fishing flies are effective in that they do not scare fish away and are able to entice the fish into biting. Dry flies imitate insects and surface-dwellers, and these are cast over the surface of the water. Wet flies, on the other hand, are submerged into the water and designed to sink near the bottom. 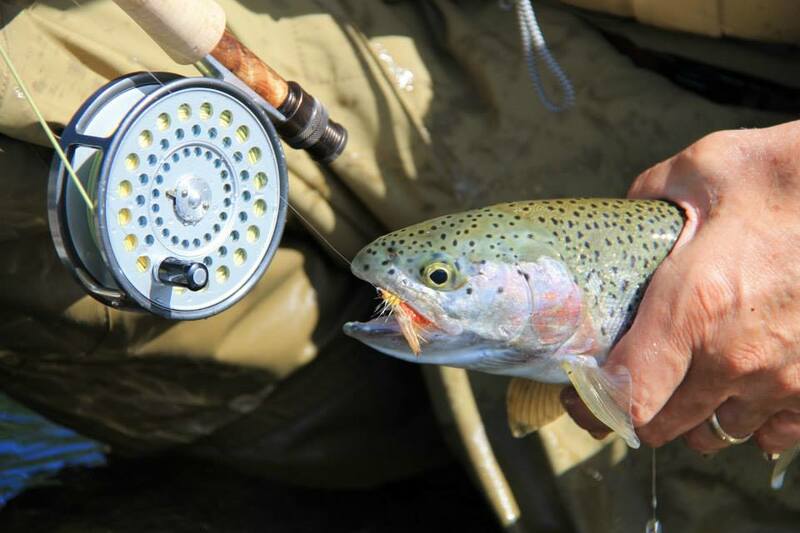 Visit our fly fishing page and click on the individual species of fish to learn more about the kinds of flies that work for each. You are not required to bring any flies when visiting us. What you wear on your fishing adventure is just as important as the gear you carry. Alaska can be cold, and roughing it in the elements requires quality gear to stay as comfortable and safe as possible. A good quality fishing rain jacket is highly recommended. They are designed with fishing in mind and incorporate many desirable features not found in a typical rain coat. Several layers of fleece or poly shirts/jackets will ensure comfort in any conditions. Chest waders are a must and modern Gortex materials have turned them into comfortable all-day attire in any weather. A small back pack works very well for carrying extra layers. Wading boots are worn outside waders and provide traction and ankle support for both wading and hiking. They are not designed to keep water out as the wader itself is waterproof. Alaska law prohibits felt bottom boots so the next best thing are studded rubber soles. We recommend Korker brand boots as they have removable soles, studs are very destructive to aircraft and boats. If you bring permanent studded boots we provide a slip on boot cover. We can also provide loaner waders and boots at no charge. A few pairs of warm socks, fleece long underwear, a hat and fingerless gloves are recommended. We offer a selection of cold weather gear including fishing rain jackets for sale if you aren’t sure what you need. We encourage our guests to do their homework and give careful consideration to the gear they will use on their fishing trip. Decide what you’re comfortable with, and what’s appropriate based on the season. June and July temps average in the mid to high 60’s while August and September averages are high 50’s to mid 60’s. It can rain anytime or you could get hot, sunny weather. Bottom line- be ready for anything. In addition to standard gear, there are a plethora of fishing accessories to help customize and enhance your experience.